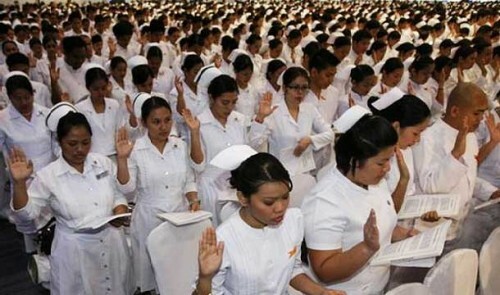 Last June 2012, the Philippine Nurse Licensure Examination was administered by the Board of Nursing of the Professional Regulation Commission. 60, 895 graduate nurses took the exam and 27, 823 successfully passed, making the passing rate 45.69%. The passing volume of nurses added to the huge pool of professional registered nurses in this country, bringing the total number of unemployed, but professionally registered nurses to more or less 400,000 (as estimated by government statistics). Last year, the Department of Health (DOH) has issued a memorandum that banned nurse volunteerism in all public hospitals under its jurisdiction. However, although this has been issued, a lot of nurses continue to work unpaid in government and private hospitals. Professional Registered Nurses are exerting efforts and are working without getting paid, and without having any benefits. The Public Services Labor Independent Confederation (PSLINK) said that many nurses continue to work in hospitals unpaid. More so, “amid the massive unemployment and underemployment of nurses in the country”, the DOH has opted to adopt new guidelines on “nurse volunteerism”. According to the group, the government has failed to enforce strict measures to prevent the exploitation of educated and lawfully-registered nurses who need security of tenure and who also need to earn for themselves and their families. The promotion of the DOH of “false volunteerism practices” has only added up to this exploitation. Annie Enriuez-Geron, the General Secretary of the PSLINK stated that “we are extremely alarmed by the plans of the DOH to develop and implement guidelines on nurse volunteerism”. She added, “Close to half a million of our nurses are jobless and desperate for work. We don’t understand why the DOH is suddenly bent on developing guidelines on nurse volunteerism when they know that this will only increase the vulnerability of our nurses to abuse and exploitation”. A public forum was held at Quezon City last Wednesday, with PSLINK and the nurse’s group, Ang NARS as participants. 100 nurses, more or less, also attended the forum together with their parents. Leah Paquiz, the President of Ang NARS criticized the actions of the government in its failure to successfully help professional registered nurses in the exploitation that they are experiencing, adding to its failure to impose penalties to hospitals exploiting this nurses using “exploitative volunteerism schemes and non-accredited training programs.”. She stated, “A year has passed since the government issuance of a memorandum that banned volunteer work and yet hospitals continue to exploit our nurses because they (hospitals) are not held accountable”. Nurses are professionals and are people too. They need money in order for them to survive. How can they serve humanity if they cannot even feed themselves? The government should really ensure that these nurses are not exploited, and that hired nurse should get paid according to what the law dictates.